We will work with you to choose topics of focus for your training. Most of our clients choose several topics to build a unique half-day or full-day training event. If you are not completely satisfied with our training, and the results our training brings, we insist that you let us know. We’ll help you make our training work for your employees, or we’ll refund your money. This training is about how to consistently deliver friendly and personable interactions over the telephone. Myra introduces 4 elements of the perfect call opening, walks your people through the best way to place customers on hold and she demonstrates how to end calls on a positive note. The outcome of this module is customer service professionals who are prepared to establish rapport with callers within the first few seconds of the call, handle the body of the phone call with poise and end calls on a friendly note. How to Talk to Customers protects your employees from coming across as rote, cold or uncaring. This training gives your employees the human relations skills they need to deliver a warm, friendly, conversational customer experience. The outcome of this training experience is frontline employees who are prepared to deliver a warm, conversational, friendly experience through positive language that sets the tone, yielding to callers, speaking in complete sentences and pacing customers. Myra Golden’s Empathy workshop is a short highly engaging professional development experience designed to inspire your people to truly feel empathy for their customers. Through videos and stories designed to evoke authentic emotion and thought-provoking discussions debriefing with Myra, your people will be inspired and motivated to convey empathy to your customers. The outcome of this training is customer service professionals who are inspired to communicate with patience, care, concern, and compassion. What empathy is and how it differs from sympathy. Empathy is important, yet we don’t want to get too personal or involved with customers. Myra walks you through how to have appropriate empathy with customers. A profound real-life empathy lesson from employees of the renowned Cleveland Clinic. Myra challenges your people to truly put themselves in their customer’s shoes. Thanks to the Internet and social media, customers are savvier now than ever before. Although this sounds like a good thing, the net result is an increase in stress for frontline customer service professionals. According to Newsweek magazine, the stress level of consumer service professionals is comparable to that of air-traffic controllers and police officers. In short, the role of customer service now ranks as one of the 10 most stressful jobs in the U.S. 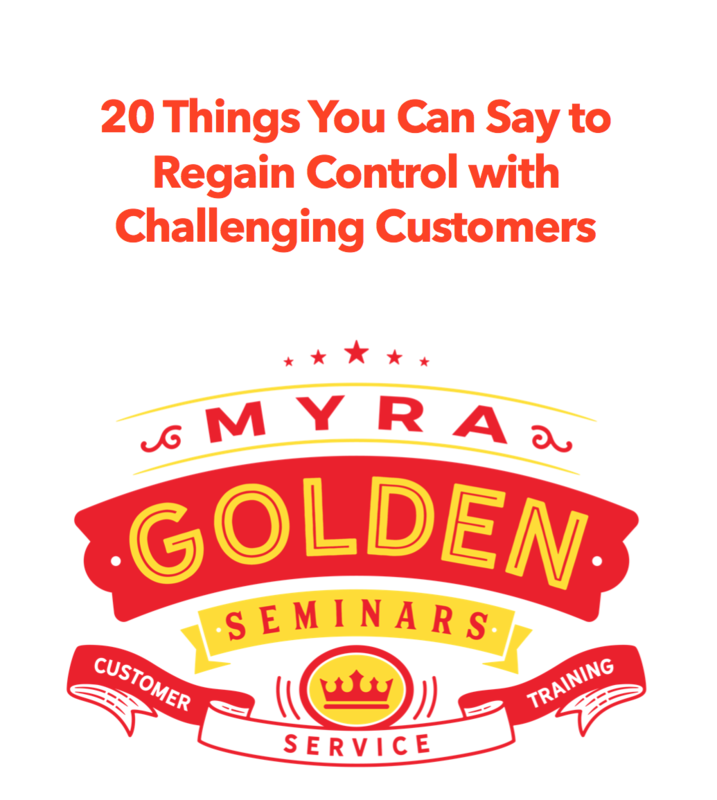 In this training Myra Golden reveals that extremely difficult customers are determined to force corporations—via the customer service professional—to give in to the consumer demands—reasonable or not. This means the customer service professional must develop a response plan. Myra, a former global head of customer care, teaches leaders how to achieve harmony with dissatisfied and difficult customers through the use of conversational Aikido. The outcome of this training is participants who are prepared to create calm, find resolutions that balance the interests of the customer and the company, how to reduce escalations, and how to create a positive conversation with challenging customers. Get 5 powerful keys from the martial art Aikido to position you to communicate assertively, create calm and take control of difficult customers. Learn why the issue isn’t the issue. The way the issue is handled becomes the real issue. Understand the importance of acknowledging a customer’s anger as a tool to de-escalate. How listening with the intent to understand a customer is a powerful tool for creating calm and getting the customer to stop talking and listen to you. —Ligea Adsit, Former Supervisor, Customer Care, Thrifty Rent-A-Car System, Inc.
Studies show the average business call lasts 2 minutes longer than it needs to. Customer service employees struggle with call control for a variety of reasons, including they don’t want to be rude to the customer, they aren’t sure how to move to closure or because the customer is rambling or angry. Using the principles of harmony, assertiveness and leading from the martial art Aikido, Myra walks your employees through the steps to politely and confidently control conversations. The outcome of this training is employees who possess the soft skills to make customers feel heard and understood, politely lead conversations and assertively bring calls to closure. An introduction to the communication chain and why you must never leave the chain unlinked – because that makes customers talk more. How acknowledging customer concern makes customers feel heard and understood – feelings that tend to remove the need for customers to ramble on. Perfect statements to help employees gain control with aggressive customers. How to use the “topic grab” approach to politely get a long-winded or storyteller to get to the point. How asking 3-closed-ended questions back-to-back instantly puts you in control of ANY conversation. 4 ways to politely bring the call to closure after you have met all of the customer’s needs. Creating calm with difficult customers is not a matter of using aggressive tactics. It’s also not about employees being a doormat, giving into customer demands or escalating to a supervisor. This training is about how to take assertive control, create calm and pre-empt escalations. The 3-step process politicians, police chiefs, and CEOs use to de-escalate a crisis situation and how you can use these same steps to de-escalate conversations with difficult customers. Exactly what to say to the customer who demands to speak to a supervisor. This method is polite and effective. You cannot ignore a customer’s expression of anger – find out why. The psychology of anger – Understand what is going on in the mind of your angry customer. Three things angry people want – knowing these things is the most powerful way to preempt an escalation. The outcome of this training is employees walk away with specific techniques to create calm, take control of the call, defuse anger and move the call to closure. This training is about how to deliver the best possible customer experience in chat interactions. Your employees learn everything from grammar in chat, to how to use the right language to build rapport, to how to deliver bad news in a chat. The outcome of this training is agents who can serve customers in chat in a way that is friendly, grammatically excellent, and to handle issues in a single chat interaction. This training is about how to deliver the best possible customer experience over text. In this course, we’ll look at everything from grammar in a text, to how to use the right language to build rapport, to emojis, to what to do if you get a prank text. The outcome of this training is agents who can quickly write text messages that are friendly, grammatically excellent, and professional. The outcome of this email writing training is employees who know exactly how to make emotional connections with customers through the use of tailoring, conveying empathy when appropriate and by strategically using personal pronouns. After getting bad news from a surgeon about her father’s heart, Myra realized that while the news was devastating, she and her family walked out of the meeting with the doctor feeling a sense of clarity and acceptance. Myra began examining what the surgeon did to be able to deliver bad news so effectively, and she started a 3-year study of how CEOs, politicians, and other professionals most effectively deliver bad news. In this workshop, Myra brings the insights she learned from studying doctors’ and other professionals’ approach to delivering bad news and she provides 4 Keys for Delivering Bad News to Customers: Acknowledge Concern, Be Clear & Unequivocal, Manage Expectations, and when it makes sense, Offer Options. The result of this workshop is an audience prepared to deliver bad news to customers with confidence, more ease, and without fearing a negative backlash from customers.